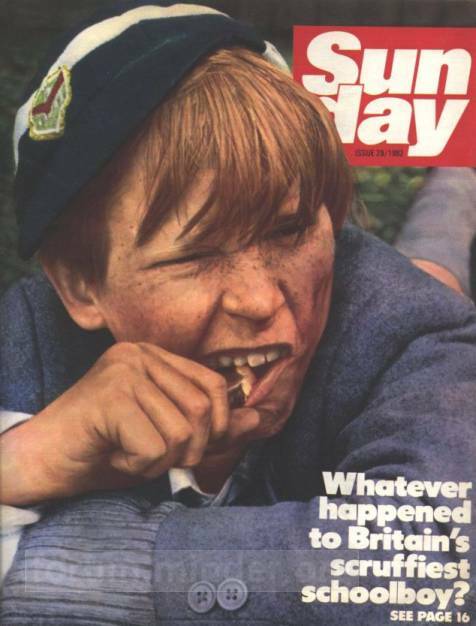 I wonder if there are many readers who remember Dennis Waterman playing Just William in the TV series. I remember that series well and I am disappointed that it seems as if they are no surviving episodes from that series. 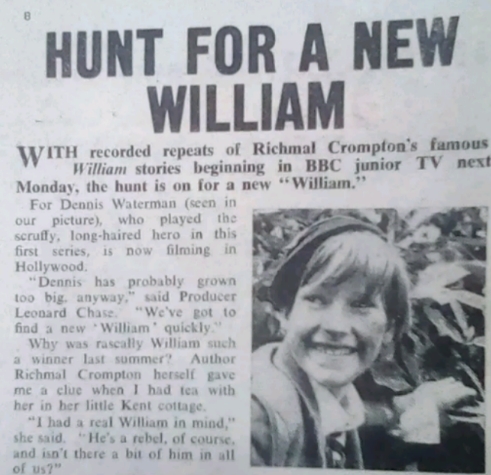 Interestingly enough Just William regenerated when Denis Gilmore took over the role later on. He was rather different to the first Dennis. Way before my time and I am nigh on 55! I think most of us know Dennis was in it. It is indeed a shame no episodes survive. We do have pics though. Just realised this was first shown the year I was born! Based on books by Richmal Crompton, adapted by C.E. Webber. Produced and directed by Leonard Chase. With Dennis Waterman (William), David Cole, Carlo Cura, Gillian Gostling; Lockwood West and Christopher Witty. 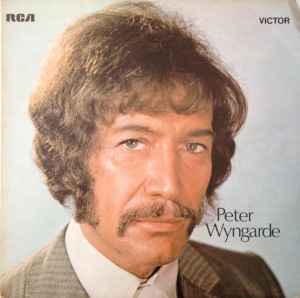 I have just heard a rumour that a TV programme that Dennis Waterman was in and was thought lost might have been found. Interesting find this, do we know where it turned up? It was in the possession of a film collector named Ray Swinden. His collection was passed over to the BFI and this was amongst it. Excellent news. Makes you wonder how much stuff is still out there? A hell of a lot I would guess. As a "recovering former doctor who fan" I have extensive knowledge of lost episodes of tv programmes, and trust me, they do turn up in some odd places! A lost Hartnell episode was found to have been sitting in a shed on a farm in new Zealand for over 30 years for example! Did anyone know that 2,885 out of 4,521 episodes of Crossroads are missing? Wonder if anyone will own up to owning them? Can you please let us know which episode this was? Thanks. Written by Leslie Sands, directed by Eric Hills. With Joseph Brady, Brian Blessed, Leslie Sands, Stratford Johns, Leonard Williams, Arthur Skinner, Diana King, David Kirk and Barbara Ashcroft. The violent death of a small shop-keeper brings Superintendent Miller into Victor Division and into conflict with Chief Inspector Barlow, who has his own solution to offer. Yes, I heard an announcement was imminent. Before my time with DW in just William. Remember the 70s series with Bonnie Langford in it.